I had a pretty frustrating storm chase today – just a quick one in between work I’m doing on a video project, a book edit and photo shoots – as I tried to intercept a beautiful shelf cloud ahead of a line of severe storms. I just couldn’t get in front of it in position to take a good photo and ended up driving in a huge circle in Brevard County, Florida, in intense rain and wind. My persistence paid off in a slightly less spectacular but moody photo of the tail end of the shelf, near the southern end of Patrick Air Force Base. See the rest of the photos here. There’s a swans’ nest in nearby Viera, Florida, that has had spectators gawking for weeks. Its enormous size and spectacular and doting parents were plenty of attraction, until the baby swans were hatched on Friday. Swans mate for life, barring disaster, and these parents seemed at least as devoted as all the fans crowding around the bank of the retention pond with their cameras and cell phones. Of course, one idiot drove by today screaming “F*** swans,” but there’s no accounting for poor taste. The swans were tolerant of their fan club, though one informed participant warned us that they have teeth in those elegant beaks, and a bite can be quite painful. As you might guess, the three-day-old cygnets are adorable. Still, their neighbor, a great blue heron, was not impressed. It felt good to slap the dash-cam mount on the dashboard, pop in a video camera and go on a real storm chase today, in the middle of a tornado watch, no less. I ran out in such a hurry that I will have to reconfigure the dash-cam mount later, but that’s OK. There was a line of intense, tornado-warned storms rampaging across central Florida with a distinct bow on radar, and I got in the way of one of the warned circulations on S.R. 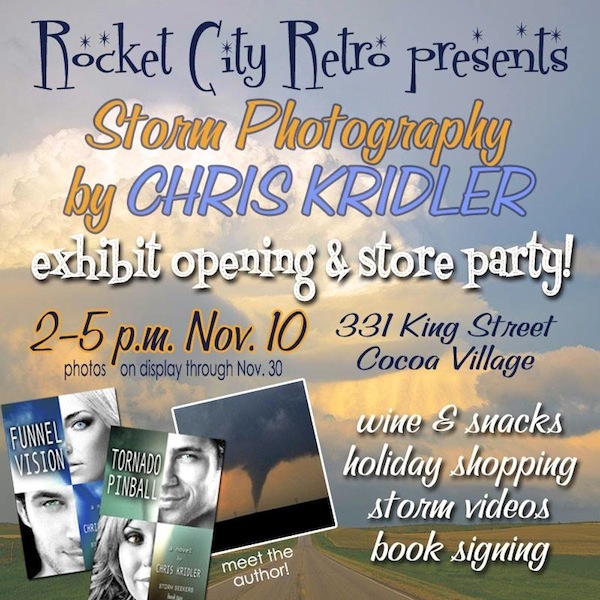 520 northwest of Cocoa and south of 528. I’ve seen plenty of gust fronts, but this one had an amazing leading edge that created a tornado-like optical illusion for a few moments. It’s too bad I was in heavy rain at the time, or I would have had more photos of it, but I got a few, and they’re in my Sky Diary storm-chasing report for March 29. There’s also a video, which I have posted here, too. Late last March, I got to chase a great squall line event, too. These kinds of Florida storms are good warm-ups for my Tornado Alley trip, when I get to learn all over again how to juggle cameras, radar, navigation and driving while trying to capture the storms of the Great Plains. I expect to head out in May and will be posting regular updates. I’m happy to note that I’m again among several storm chasers with whom Midland is partnering to show off the capabilities of its cameras. New this year is the XTC-400 HD Wearable Video Camera. I’m looking forward to trying it out, hopefully on a mothership supercell! 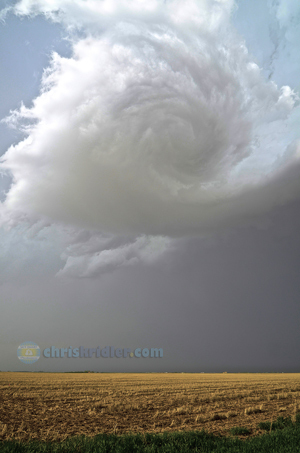 Wide-angle lenses do amazing things to mothership supercells. I always want to be better, and I am never satisfied that I’m where I should be in anything, especially in my passions – photography and writing. 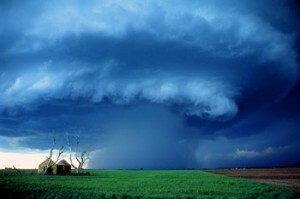 Storm photography, especially, always leaves room for improvement. If the photo in itself is great, it might have been shot from a better angle, at a different time, or on a different storm. Because in storm chasing, the first rule is location, location, location. The second is timing. You can be a technically great photographer (I’m still working on that, too) and never be a great storm photographer if you can’t get into the right place at the right time. In 2013, I saw a lot of extreme weather, most of it packed into less than three weeks during my annual whirlwind tour of Tornado Alley. Yet I still curse myself for not being in better position on some of the storms I saw and for missing others. Such is always the way of the perfectionist; that drive is a blessing and a curse, since perfection is never possible, except, perhaps, in the sweeping curves of a supercell at sunset. I’ll leave perfection to nature and post my imperfections right here. I’ve put some of my favorite weather photos of the year into a video slide show. Watch it here or on YouTube, or, if you like, see the photos themselves. The blue moon – the full moon on August 20 – was a magical photographic opportunity for me. 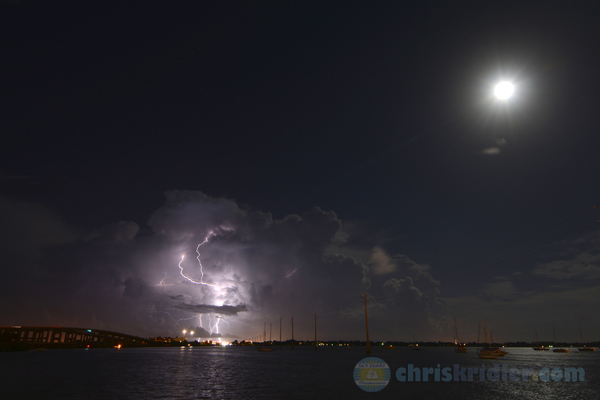 I was able to shoot a lightning storm with the full moon overhead, from the beautiful vantage point of Cocoa, Florida, looking east over the Indian River Lagoon. I’ve photographed not-so-great shots of the moon with a thunderstorm before, but nothing like this. Better yet, there were multiple shots, though the one shown here is definitely my favorite. 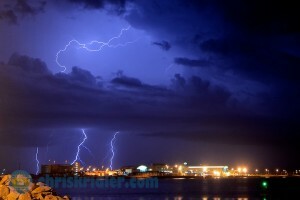 I’ve posted several shots of the lightning and the moon, along with a video timelapse of my stills, on my sister site. Look at them here. Meanwhile, prints of this photo (and other lightning images) can be ordered here. When I’m on the road during my annual storm-chasing trip in May, I try to post as many reports as I can here and on my Sky Diary site. But thousands of miles of driving and serious sleep deprivation often mean that I skip days and have to finish the reports when I get home – especially for the less momentous chases. This week, I finished up those reports in between Florida storms. 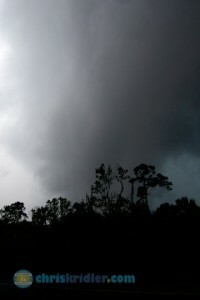 See all the 2013 storm reports in this index – as I photograph Florida storms, I’ll add more photos and videos. With the reports done, I’m looking forward to having more time to invest in writing “Zap Bang” – the upcoming third novel in the Storm Seekers Series. 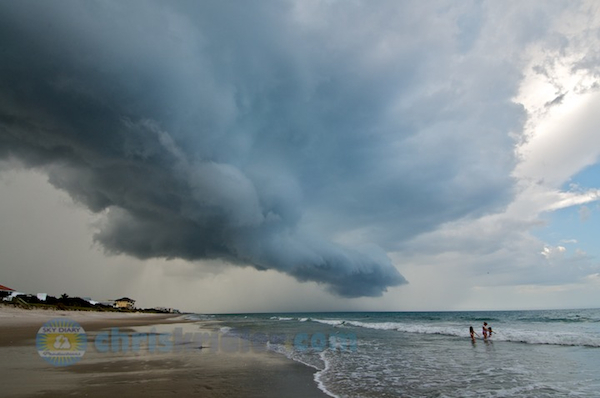 The beaches have been under siege here in Brevard County for the past couple of days as ominous shelf clouds have swept over the sun-worshipers and surfers, harbingers of downpours and lightning close behind. 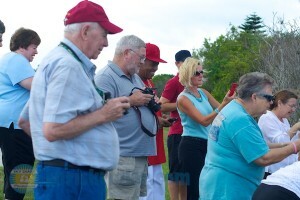 I’ve caught photos in the past couple of days at Cocoa Beach and Satellite Beach. In both places, some folks didn’t seem to be in a hurry to escape the lightning danger, which was high. I take a risk, too, when I stand on the beach to shoot a photo, and I’m well aware of it. 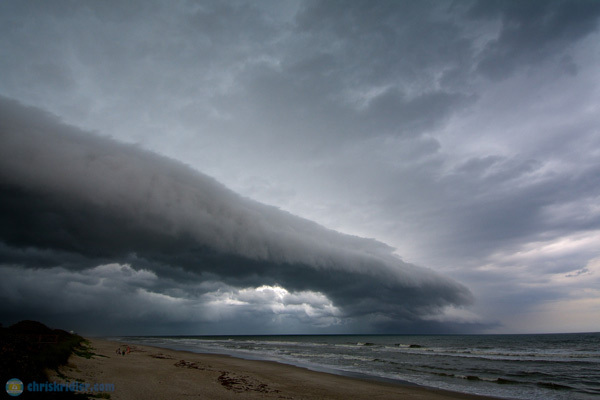 Today’s storm over Satellite Beach was especially beautiful. As dangerous as the lightning might have been, I couldn’t look away. 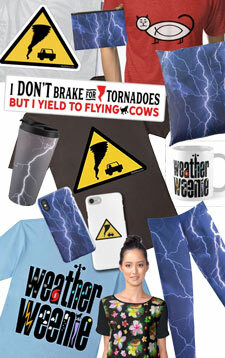 See these and all the 2013 chase reports here. 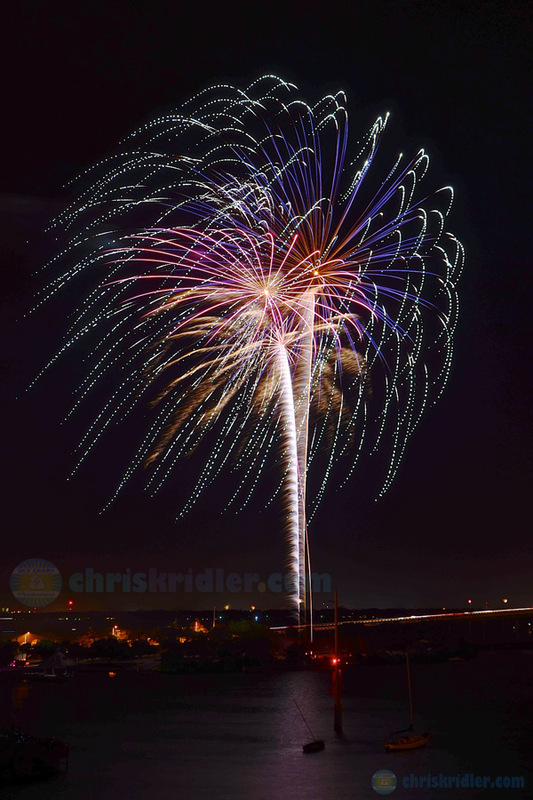 I was lucky to get invited to an Independence Day party on a top floor of a condo overlooking the Indian River Lagoon and Cocoa, Florida’s excellent fireworks display on Thursday. Shooting fireworks is a lot like shooting lightning – you need a tripod and a camera you can put in manual mode so you can hold the shutter open for several seconds. But at least you know approximately where the fireworks are going to be. Want to see more? Here’s a slide show. Prints are available.